In fact, study after study has shown that widespread use of corn ethanol has proved to be a disaster for the climate. The federal mandate to blend corn ethanol into gasoline has led to the destruction of millions of acres of grasslands and wetlands to suit higher demands for corn for ethanol productions. When farmers plow up grasslands and wetlands to grow corn, they release the carbon stored in the soil, contributing to climate-warming carbon emissions. Recent land conversions to grow more corn and soybeans released 131 million tons of carbon into the air between 2008 and 2012, as much as 34 coal-fired power plants, according to a study released last April by researchers at the University of Wisconsin. An analysis by the Environmental Protection Agency found that because of land use changes, corn ethanol produced today has been much worse for the climate than gasoline. The study by the Renewable Fuels Association, a trade group of corn ethanol producers contended that land use changes amount to only a quarter of previous estimates. The study authors declared it was a “best estimate.” Whose best estimate? Probably the ethanol industry funding the study. The fat cats of the ethanol industry need to face facts – corn ethanol has been a climate catastrophe. Now is the time to end corn ethanol’s chokehold on the American fuel supply and pave the way for biofuels that meet American energy needs and help solve the climate crisis. 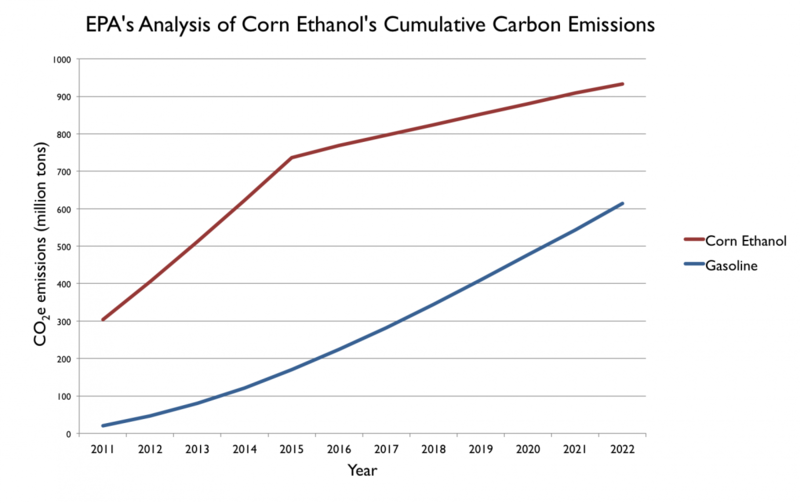 This chart compares emissions from corn ethanol as the production increases over time to an energy-equivalent amount of gasoline. The emissions are cumulative between 2011 and 2022.